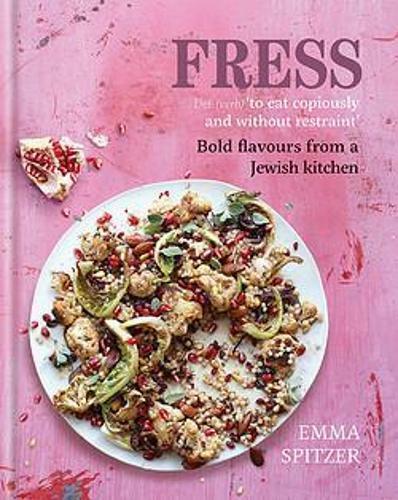 Fress (Yiddish): ‘to eat copiously and without restraint’ ‘Fress, the knockout debut cookbook from Emma Spitzer, a 2015 finalist on Britain’s 'Masterchef’ show, seamlessly blends Ashkenazic and Sephardic culinary heritage … Spitzer is a Brighton-born travel business entrepeneur who now caters and teaches cooking classes … her voice is that of a home cook privileged to be a part of the new food world order, acknowledging her Russian roots, her mother-in-law’s Israeli feasts, British celebrity chef John Torode and cookbook author Claudia Roden. There’s a touch of Yotam Ottolenghi in the book’s images - vegetables that look lush and savoury on the plate. Props to the styling team, who make even beef-stuffed artichokes look handsome.‘ The Washington Post Emma Spitzer’s style of cooking is unfussy and uncomplicated, extracting the maximum flavour from the humblest of ingredients without spending hours in the kitchen. For Fress, her melting pot of inspiration embraces Poland and Russia, Jewish recipes learned from her mother, travels in Israel, Egypt, Jordan and North Africa, as well as Algerian recipes shared by her mother-in-law. Big on flavour and spice, Fress is full of happy, sociable food to feed the soul.